Other Distinguishing Features: Rakkum has white skin, two fingers on each hand, no nose and a weird shaped head. Rakkum was a brilliant scientist who was recruited by DarkLord to serve him, constructing a portal to link between realities that used the Eternal Youths as a power source. Although the version of him that lived on Darkworld was killed when that planet exploded, Rakkum remained alive on Earth. When Herakles was putting together his God Squad he selected a native of Earth to serve as a local guide. Rakkum was chosen and agreed to serve this group rather than simply being transported to Godworld to live. The God Squad’s missions ultimately ended when they clashed with Zeek who soundly defeated them all. After the destruction Godworld, Rakkum was able to return to his true allegiance and brought over another version of DarkLord to Earth. This world ended up getting consumed by Universo but another version of Rakkum existed in the reality that Dragon ended up on after his confrontation with the younger Damien DarkLord. The presence of DarkLord had not been felt on this world and Rakkum struck an alliance with the Sky-Riders in order to bring his master over to this reality. The Liberty League, Gods and other heroes combined their efforts to defeat the villains and prevented Rakkum’s goals from being achieved. 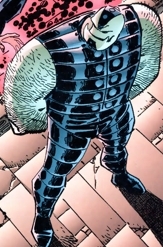 Rakkum was forced to live amongst the Gods and fought alongside the God Squad to apprehend Thor.